2° Persons not tax resident in France, but owning propery in France. Except in cases stated under a and b of 4 of article 6, married couples are subject to a joint taxation. when being in the course of a legal separation or divorce, they have been authorized to have separate residences». 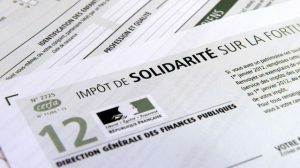 The ISF is an annual tax owed by persons, whose assets are valued in the same household as of 1st January (the French tax code considers the married couple and the minors as a single tax entity) when reaching a threshold which, since 2013, has been fixed at 1,300,000 euros.